Hood River, OR (in the Columbia River Gorge one hour from Portland). To inspire presence and courage to make meaningful connections with each other and nature. 1) Learning to surf a shortboard. It is so humbling and a constant reminder of the importance of balancing effort and surrender. 3) Developing a yoga class series for victims of trauma (to be co-led with a friend who is a mental health counselor). So much more than yoga! It’s recognizing the possibility of peace and happiness in each of us, and an approach for connecting to that peace and happiness through mindful, intentional living – the asana is simply part of that approach. And importantly it’s not just a “close your eyes and find zen” philosophy; Blissology celebrates interconnection, not isolation. 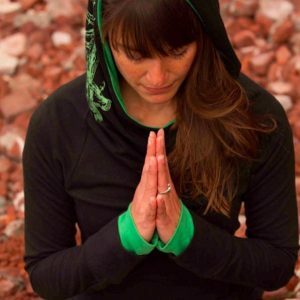 What are 2 of your favorite songs for yoga? Finding and choosing music for class is an aspect of teaching I really enjoy. I discovered East Forest when he played for Eoin’s class at Wanderlust and his work is fantastic (especially live!). I use Toad Lick often, but he has countless other songs perfect for a more mellow mood and savasana. Another current favorite for vinyasa is Blood Flow by Ritual. I’m in the midst of re-reading two favorites. The Fear Project by Jamal Yogis is a really interesting examination of the ways we experience and overcome fear (with an emphasis in the context of surfing). The other is fiction: A Constellation of Vital Phenomena by Anthony Marra. It’s a beautifully written heartbreaker about the power of love. When I first came to yoga I was a stressed-out attorney and my mat was my escape and way to find calm and grounding. As my practice and lifestyle have evolved (I no longer practice law), I see the calm and centeredness as my true nature, not just a fleeting feeling I only experience for hour-long pockets of time. So I yoga regularly to stay in touch with that essence. That gives me greater clarity about myself and others, and then I’m in a mindset to really appreciate what I’m doing and what’s around me, be it riding powder through trees on my snowboard or walking my dog in the rain. I can see the practice ripple out in my relationships and I value how powerful it is. Through my practice and my teaching, which are both very Blissology-inspired. I’m lucky to live in a place where nature appreciation is easy – when we find tadasana in class we can actually look at a mountain, and feel fluidity in our movement like the river that flows before us. And I really try to foster a Blissology vibe in class – we laugh, smile, high five and appreciate who we’re practicing alongside. 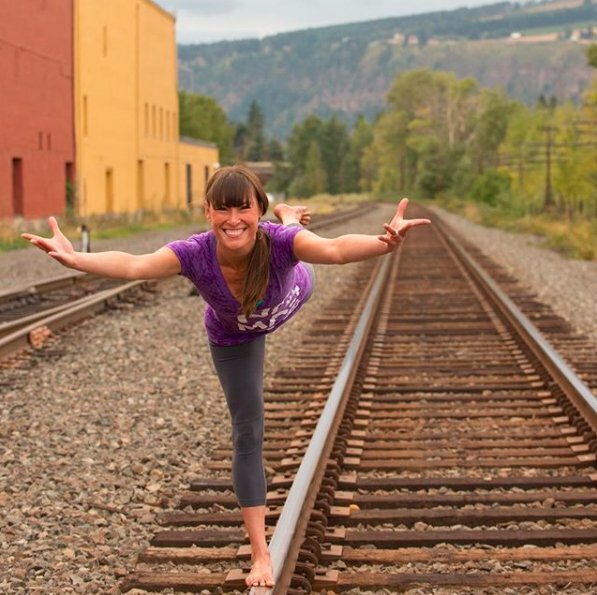 More about Victoria and how to connect with her on her Bliss Army teacher profile. The Blissology Yoga Ecology Surf Hub: Santa Cruz! After 4 weeks away in some of my favourite places on the planet specifically Australia, New Zealand and Hawaii, it is amazing to come back to a place we call home. The beauty of this place overwhelms me. We’ve spent years searching for places that had incredible organic food, beautiful nature, cool people, access to city life and of course, surf!! And I can finally say, I’ve found the most rocking place. If it wasn’t, we’d be somewhere else. Santa Cruz is nestled between the mountains and the sea, and has a truly eclectic mix of people, places and experiences to offer! It’s just 1 1/2 hours from downtown San Francisco, an hour from SFO airport and 3o mins from San Jose. We’ve got world class surfing, mind blowing hiking, great beaches, and amazing local food and restaurants. Santa Cruz will keep both the foodie and nature lover in you satisfied! The climate in California comes down to one phrase: dress in layers. Its common to start your morning in a jacket and beanie and end your afternoon in a tank top and flip flops. Autumn is California is the best time of year for great weather (and that’s when our courses are happening!) Although mornings and evenings can be cool, the daytime temps often get into the 70′s and 80′s this time of year. Luckily Santa Cruz has no shortage of beautiful outdoor spots to enjoy. If relaxing on the beach is what you’re looking then go here for just a few stunning beaches to explore! If a little more activity is what you enjoy then bring your hiking shoes! The Santa Cruz area is home to some amazing redwoods forests and hiking trails. Here’s just a few to add to your list! Ocean lovers be warned, Santa Cruz is going to blow your mind! It’s home to some of the best surf on the west coast, from the infamous Steamer Lane to the aptly named Pleasure Point. Santa Cruz offers waves for anyone from newbie to novice. This is also a great place for bodysurfing, boogie boarding, stand up paddle boarding, ocean swimming! Surfing lessons as well as surfboard, SUP and wetsuit rental is readily available at many locations. Just blocks from Pleasure Point Yoga there is a RipCurl, a Freeline, and an O”Neil surf shop. All will be happy to help you with your ocean minded needs. If you want lessons for beginners cruise over to the Westside of town and check out: Cowells Surfshop. If you’re looking to enjoy the Ocean without getting we think about joining on of the Chardonnay cruises. They offer a host of day and sunset cruises to enjoy. A Santa Cruz classic is the Beach Boardwalk (enter the Beach Boys background lyrics here!) It offers rides, games and snacks, all while enjoying the sweeping views of the Pacific! If your more the take a take a stroll, do some shopping, people watching type head to Downtown Santa Cruz for a variety or people and shops, or for a more mellow scene zip over to Capitola Village. Another fun area worth a mention is Swift Street. This is an up and coming par of the westside. Formerly old warehouses, it has been converted into wineries, restaurants and shops. Be sure to swing by Sawyer Land and Sea Supply, Santa Cruz Mountain Brewery, of one of the many Local Tasting Rooms! On your way out be sure to take a walk or drive along the scenic West Cliff. Don’t be surprised at dolphin, sea otter, sea lion and whale sightings! And we haven’t even gotten to the Eats and Drinks this lively town has to offer! High on the list are the Santa Cruz Farmers Markets which happen a few times a week in various locations. This is a bustling display of a bounty of local, seasonal offering! Even if you’re just there to feast your eyes, this is an experience not to be missed. Go here for a list of times and locations. The Verve: Local coffee that will knock your socks(or flip flops)off! If your want to explore the surrounding areas, consider Carmel and Monterey 1hr drive, Big Sur is 2hrs drive, and San Francisco a short 1.5hr from Santa Cruz! Want to be Happy? Eat honey consciously! Whenever I travel I bring back honey with me. It has the essence of the local soil, the flowers, the fruit… Everything vital about a region. All in one amazing nectar-filled liquid that tastes so divine. The key to happiness is to sift through all that is in front of us and see the interconnection, beauty and small miracles. Focus on them with wide eyed wonder and an open heart. Honey is my muse… I learned this from my dad! 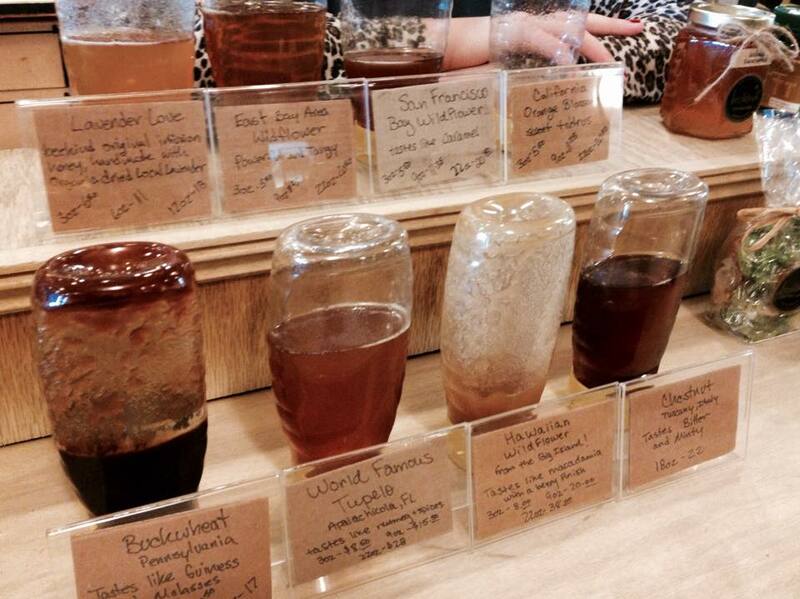 Share your honey stories with me in the comments below :-)! peace + aloha, Eoin. Bali is our second home. It’s intense, we won’t lie. It’s part of the forth most populated country of the world, Indonesia so streets crowded with scooters and plastic on the beaches is more common than you think. But it has incredible natural beauty and the expat culture is amazing and it’s bursting with great restaurants and yoga studios/retreat centers. In fact, we’ve never seen so many yummy, funky healthy restaurants per square mile on the planet. Maybe Venice Beach and Santa Monica might be a close second. But perhaps the most incredible thing about Bali is it’s people. The Balinese are generally joyous, caring people who are incredibly grounded spiritually and have a incredible village culture. The village still does raise a child in Bali. We usually do our courses about 20 km Northwest of Denpasar (where the airport is) in a town called Canggu (pronounced “Chawng-Goo”) It’s got great restaurants, fashion and surf beaches (Brawa and Echo Beach). We will be running a YES (Yoga Ecology Surf) Retreat in April there at Desa Seni and a month of 200 and 500 level Teacher’s Training courses in May 2015 at Samadi. Ah… so many things but I think my top picks are: drinking fresh coconut water; immersing myself in the warm ocean, practicing yoga in a beautiful wood floored studio with my only walls the foliage of tropical ginger and palm trees; and catching waves. Of the beaches in the southern part of Bali, which incidentally is the only part of the island that has golden sand, Bingin is still quiet and beautiful and unspoilt. I love slipping away here for a few hours and swimming in the natural rock pools when the tide is high. I also love the beaches north of Candidasa in eastern Bali, which is still a little more quiet. We’ve visited so many sacred sites in Bali over the years, but one that impressed me was Tirtha Empul, the temple of the holy water, a walk up a hill in the mid north of Bali. The Balinese believe that this water is related to the holy water from the river of the heavens (like the Ganga in India) and they use the water from this temple in all their rituals. The day I happened to be there was a ceremonial day for anyone afflicted with disease, emotional or physical, and families came in throngs to receive an immersion in the holy water. The women dressed in their finest, the men ushering their families through and prayers and chanting. There were tears, laughter, wails and joy, so many emotions, so many prayers, all in one potent place. Desa Seni is always our landing spot, a microcosm of Bali in its beauty and a beautiful community. We know the staff, they’ve seen our son grow up and it feels like home. We usually stay in a villa that we rent longer term after a few days at Desa seni! It used to be that most of the healthy and raw food that yogis love could be found in Ubud, but it has spread to the surf coast as well, thankfully! In Ubud, I still love Kafe, the smoothies in particular are so delicious, but in Canggu, I love the new restaurant at yoga + wellness center Samadi – they have fresh vegan food and their dosas are so yummy. A new café and juice bar that opened just last year is Sugarcane near Berawa Beach. The green juice and smoothies are sublime and they have a kids play area, perfect for those with little ones! We also love Land of Green Ginger, which takes you on an Asian flavor tour and has authentic chai made from scratch. Closer to Seminyak Watercress is a standout especially for Brunch and their daily salad specials and Desa Seni has a lovely menu with most of the organic veggies grown right on the grounds. I love Nasi Campur; a mix of vegetables and curries and rice, so delicious and healthy, especially with freshly ground sambals. I also love a good gado gado, a fresh salad with a peanut sauce. Some of my favourite spots have been at the studio at Uluwattu Surf Villas on Bali’s southern tip, as well as at the cliff’s edge where you feel as though you are part of the terrain. You can watch the waves and surf on your mat at the same time. Desa Seni is another favourite spot and I so want to stay at Bambu Indah in Sayan near Ubud just to practice at their yoga studio! There is a daily practice of spirituality in Bali. The people are immersed in their Hindu faith and they don’t question it. You see pure faith and rituals flow into the rhythm of each day. It is impossible not to be touched by that simple beauty and it inspires me to simply practice without expecting any outcome from my yoga practice. It’s really the message of the Gita. Perform an action and relinquish all expectations of the action. Bali is a living, breathing emblem of that. Of course I know this is interpretation and that the people are performing rituals to enhance the wellbeing of their families and themselves, but there is still presence and perseverance in their doing this day after day after day and living their life centered around their faith. Also, Bali is one of the warmest, most humid places I have ever spent time in (and I grew up in India) and there is nothing quite like tropical warmth to allow you to go deeper in the yoga asana practice. I love that. It’s not really a secret, but it can be hard to get a spot here as it is so small, but Mu Bali in the Bukit is one of my favourite hideaways. Above the cliffs of Bingin beach, it is run by a French man and resembles a Tahitian inspired paradise. The homes are round and made of straw and curved wood, open on most sides. You can linger over fresh home made food and long table dinners with other guests or simply enjoy some chill time on your own. We took our son there during the break of our intensive month long YTT a few years ago and really recharged.